That would be Bristol, Connecticut, population 61,000. In the summer of 2010, the City of Bristol awarded development rights to Renaissance Downtowns, a real estate development firm that began investigating the application of crowdsourced placemaking to its developments in 2008. Renaissance has become increasingly committed to it, especially with the growth and energy of Bristol Rising!, the grassroots ‘beta community‘ representing the triple-bottom-line future of downtown. October 1, 2010: Renaissance Downtowns commences crowdsourced placemaking program. October 20, 2010: Renaissance identifies initial supporters, and present a triple-bottom-line statement for review. October 25, 2010: Crowdsourcing agreement introduced. November 4, 2010: First beta community meeting as happy hour. Group names itself “Bristol Rising”. 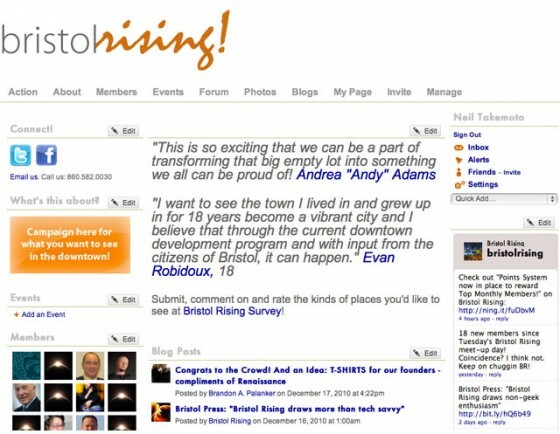 November 5, 2010: Bristol Rising website launches. November 10, 2010: Bristol Rising 100 commences. December 7, 2010: Bristol Rising Housing/Commercial Sign-Up List posted. December 7, 2010: 100 members reached. December 14, 2010: Second beta community meeting as live group-oriented crowdsourced placemaking. December 14, 2010: Bristol Rising Survey, an online crowdsourced placemaking decision-making tool, launches. “How the triple-bottom-line will save a town’s economy“. “Bristol, Connecticut first to crowdsource large-scale place“. “Developer announces crowdsourced placemaking program“. “Developer to crowdsource creative downtowns“.